Panasonic backs HDR over Dolby Vision - promises improved TV audio | What Hi-Fi? Panasonic is pushing full steam ahead with its support for HDR (High Dynamic Range) video technology in 2015, but there are no current plans to support Dolby Vision. 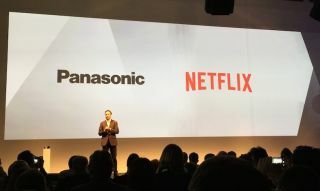 Netflix has already promised to start streaming 4K HDR video this year and now Panasonic has reaffirmed its commitment to the video technology. Speaking to What Hi-Fi?, Hiroyuki Iwaki, global head of TV product planning for Panasonic. said: "We'll be prioritising and pushing HDR as the industry standard." Iwaka also confirmed that Panasonic's recently launched 4K TV sets wouldn't be able to support Dolby Vision, pointing to the fact that this technology requires additional hardware which won't feature in this year's models. Manufacturers claim that HDR delivers improved picture performance and it's being investigated by a number of other TV manufacturers, including Sony, Samsung and LG. At its European Convention in Frankfurt, Panasonic confirmed that its new CX800 flat and CR850 curved 4K Ultra HD TVs will support streamed HDR content when it becomes available later this year. Panasonic has also placed added importance on TV sound this year, with a new TV speaker system making its debut in the company's premium CX800 series (pictured above). "I feel very sorry for the European consumer," said Iwaki, "TVs have become thinner, and we've been sacrificing sound quality. We need to keep a balance." We've certainly noticed a downward spiral in general TV sound quality in recent years - though some companies, notably Sony, have made decent efforts to rectify this - so we'll be interested to hear if Panasonic has managed to overcome this problem.